Are you looking to create a healthier version of a holiday meal for your family? Everything you make for the holidays doesn’t have to be bad-for-you-food. There are ways to make good-for-you-food. 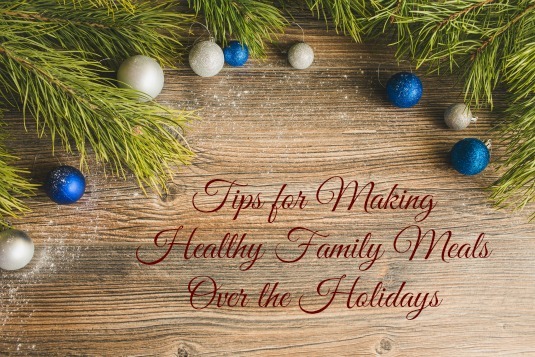 Check out these tips for making healthy meals over the holidays! If you’re looking to make delicious meals over the holidays, but don’t want to go sugar and carb crazy, consider substituting some of your favs for healthier alternatives. Instead of mashed potatoes, you can have caulitatos. Instead of using cool whip, you can make your own version out of whipping cream. A lot of sugar is promoted over the holiday season. Instead of just buying whatever you want and not knowing what’s in it, consider looking at the packages. Pay attention to how many sugars and carbs are in each food item you buy. Plus, looking at the ingredients can help you know what to buy and what not to buy. Instead of going out and buying every single food item you want at your holiday meal, consider making a few items from scratch. Sometimes it does take longer, but it’s so much healthier in the end. For example, making your own frosting, eliminates all of the added sugar and oils that you would otherwise be feeding your family. One huge reason people always go for junk food options is that they don’t plan ahead for the holidays. It’s easy to grab a box of processed food because it’s already prepared. Taking the time to prep ahead for meals is one way to make healthy meals over the holidays. Before you head to the grocery store for your holiday meals, make a list. It’s so easy to forget what you want/need to make that healthy meal. If you can swing it, write out the list on your phone/tablet and bring it with you. Most people don’t forget their phones, so this is an easy way to remember that list, even after you’ve wrote it. Making healthy meals over the holidays is all about having willpower. Sure, the holidays are all about yummy foods and delicious desserts, but it’s not always worth sabotaging your health over. Feeding your family what is good for them, sometimes stumps what tastes good. What tips do you have for making healthy meals over the holidays?